Happy Anniversary Balloon - Gifts - Balloons - Perth Florist Perth in Western Australia specializing in flower delivery of roses and wild flowers. 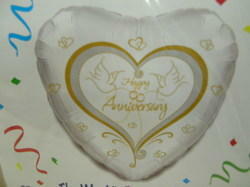 45cm foil balloons are filled with Helium and float above your gift. All balloons are supplied ONLY as an accompanyment to floral of gift presentations. Special year anniversary balloons are under a separate category.